Media Credit: Hatchet File Photo. Megan Leftwich is one of eight female professors hired by the School of Engineering and Applied Science recently. As GW looks to narrow its gender gap among its engineering professors, it’s had to compete with top universities and companies around the country. During the School of Engineering and Applied Science’s hiring spree over the past five years, officials recruited about four dozen research-oriented faculty from the Ivy Leagues and top tech schools. But just eight of those researchers were women, as the engineering school’s attempt to attract female faculty members remains slow even during its fastest hiring period. About 17 percent of SEAS full-time professors are female, up from 13 percent a decade ago. Dean David Dolling said even though GW is attracting accomplished researchers, top female candidates are in demand because of the gender gap across science and engineering, so they often have their pick of institutions. 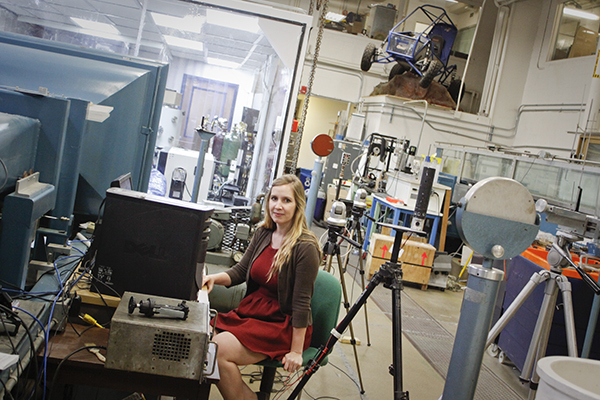 Nationwide, about 27 percent of engineering and applied sciences professors are women. Recently, Dolling said they lost out after extending an offer to a civil engineering candidate because of this problem. Dolling said the school is prioritizing female hires in part to serve as role models for the about 40 percent of SEAS students who are women – far above the national average. The school also ranked No. 5 in the country for most female master’s and Ph.D graduates last year. Vice President for Research Leo Chalupa said University President Steven Knapp met this week to court GW’s top choice for its new genomics research institute. If the candidate comes to GW, she would be a prominent female leader for GW’s science and technology community. “She’s going to get big-time grants. The president will have played a key role in getting her recruited,” Chalupa said. During recruitment, Dolling said they keep searches broad enough to attract a wide range of applicants and they also make sure a member of the committee focuses on keeping female and minority candidates from falling through the cracks. Last year, the school successfully recruited female professors away from Columbia and Boston universities. A female Stanford graduate who was working at a technology start-up in Silicon Valley also joined GW. “I think it’s going to get easier for us. When you get a critical mass, it’s easier to recruit,” Dolling said, adding that the new Science and Engineering Hall, opening next year, will continue to lure in top researchers. Assistant professor of mechanical and aerospace engineering Megan Leftwich, one of the recent hires, agreed that when diversity is enhanced, groups perform better. With more female faculty for students to look up to, female engineering students will be more likely to graduate, which she said will also help to close the future gender gap. “The success that GW has of graduating female engineers at the [bachelor’s] level will increase the number of women applying for these, and other engineering jobs in the future, continuing to close this gap,” she said. Although women fill almost half the jobs in the U.S. economy, they make up less than 25 percent of STEM employees. That number has remained stagnant for the past decade, even as more college-educated women flood the workforce. Cynthia Hess, study director at the Institute for Women’s Policy Research, said having more female professors will help normalize being a female engineer for students, who she said become discouraged from pursuing degrees in engineering if they cannot picture women in the field. She added that there are many ways schools can make it easier for female professors by creating programs to help women balance work and their personal lives, especially because working women are often responsible for childcare and housework when they go home at the end of a work day. “When women go into classrooms of students and don’t see other women, it’s hard to visualize yourself being in that position one day,” Hess said.